Five days after a failed launch, the Russian Soyuz rocket system has been pressed back into service. 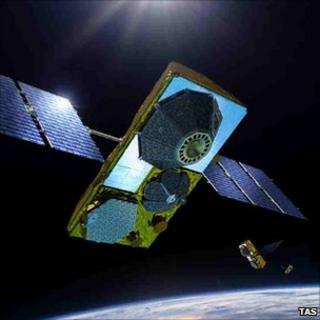 The vehicle successfully put six spacecraft in orbit for US satellite phone and data company, Globalstar. The Soyuz lifted away from the Baikonur Cosmodrome in Kazakhstan at 1709 GMT, ejecting the last of the six Globalstar platforms an hour and 40 minutes later. Last Friday, a Soyuz malfunctioned soon after launching from the Plesetsk spaceport in northern Russia. Parts were reported to have crashed back down into the Novosibirsk region of central Siberia. Last week's Soyuz was a type 2.1b, compared with the 2.1a version used for the Globalstar mission. The two variants share many design features but use different engines in their third segment, or stage - the part of the Soyuz said to have been responsible for the failure five days ago. Wednesday's successful outing will come as a huge relief for Globalstar. The company is the first of the major sat-phone concerns to start upgrading its systems. The six latest satellites follow 12 others launched in July this year and October last year. The upgrade is a pressing concern for the company because its existing constellation is failing. Rolled out in the late 1990s, many of these original satellites have suffered suspected radiation damage to their S-band transmitter equipment, which has limited their ability to handle two-way communications. Globalstar is pinning its future on its second-generation constellation. It plans to put in orbit at least another six satellites to boost service reach and quality. Following Wednesday's flight, Tony Navarra, Globalstar's president of global operations, was quick to thank the Soyuz team and Arianespace, the French company that markets commercial Soyuz launches through its Starsem subsidiary. "These satellites were flawlessly placed exactly where we needed them so that our ground stations could find them on the very first pass," he said. "It's amazing that we can find six satellites within 30 minutes of them being placed into space." Investigations continue into the cause of last Friday's launch malfunction, which resulted in the loss of a Russian Meridian telecommunications satellite. It was the latest in a recent run of flight failures for the national rocket industry. In August, a Soyuz failure on an unmanned mission to resupply the space station led to a six-week suspension of flights. On 18 August, the week before the loss of the space station mission, a Proton rocket failed to put a communications satellite in its proper orbit. Back on 1 February, a Rokot launcher also underperformed with a similar outcome. And on 5 December last year, a Proton carrying three navigation spacecraft fell into the Pacific Ocean. This particular failure is widely believed to have contributed to the decision of the Russian government to replace the then space agency chief, Anatoly Perminov. Vladimir Popovkin took over as the head of Roscosmos in April. The rocket failures come on top of the loss of Phobos-Grunt, Russia's most ambitious planetary mission in decades. It became stuck in Earth orbit after its launch in November and will probably fall back to Earth next month.